July Release: Keep Dazzling Them! Today is July Release for My Time Made Easy ™ LLC! Check out our NEW! PRODUCTS —>HERE! You won’t want to miss a thing! View our GALLERY! —> HERE! Always full of amazing gift ideas, just for you! Want to participate in some fun weekly challenges? Check out our BLOG! —> HERE! To celebrate our July Release we always start with a Group Post full of gifts and project ideas for you! Today the team and myself will be using one of our NEW! 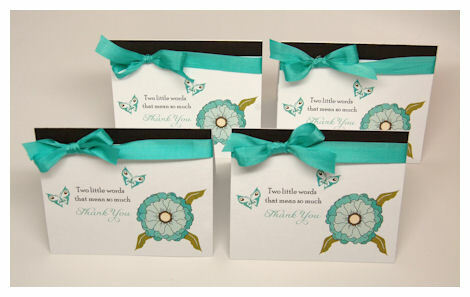 Pretty Packaging Templates to create a gift set of 4 Cards! 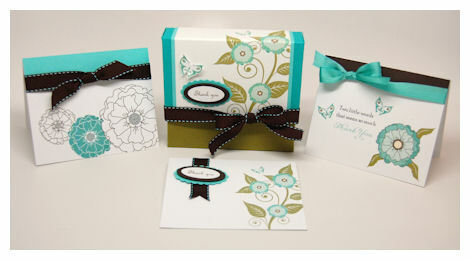 You can never have too many card set ideas (wink). 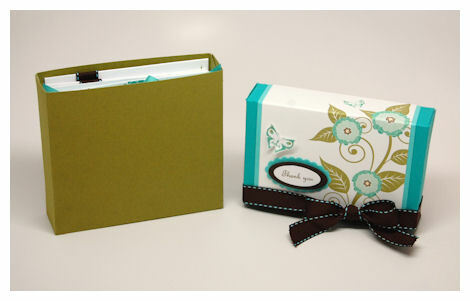 Today my project will be using the latest For Keeps Pretty Packaging Templates. 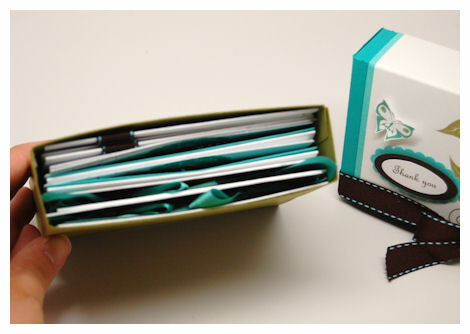 Now I DID want to use our other template of the month: Carry Clutch as I have not shared anything about it yet, but this particular project idea (at least not on my blog-see the store or gallery), just flowed, so I went with it! Sometimes you just gotta go with where inspiration takes you! I really enjoyed using the For Keeps template. My design for the lid was UBER simple! I simply printed the floral vine pattern from the Blooming with ElegancePretty Printables Digital Paper for my lid! I love how it turned out. 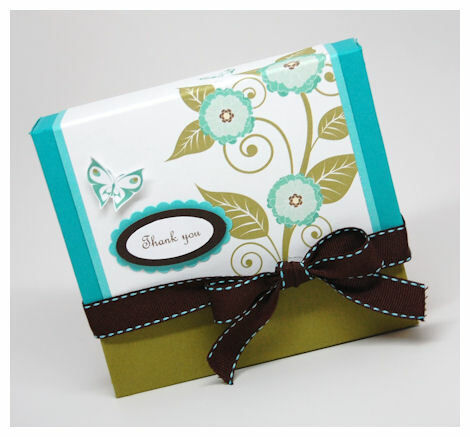 I then took the Thank You sentiment from the Keep It Organized © set, printed it in chocolate ink, then punched and layered it onto my label. 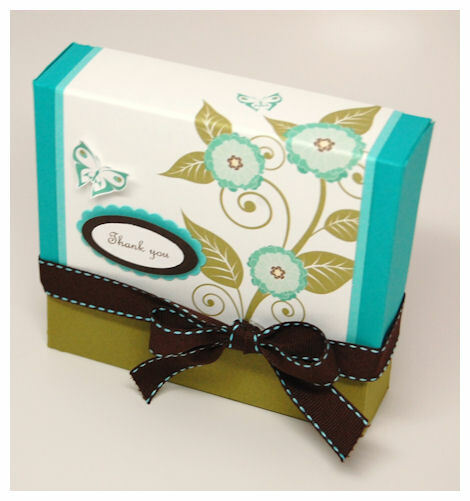 I used the Base Option #2 so that this could hold the 12 thank you cards I created. There are 3 different designs, 4 of each. Just remove the lid, and you can see that they fit nicely in here. The card sizes are 4 3/4 Wide X 4 1/2 High. Who would’ve thought this could fit SO MANY cards?! But it does. 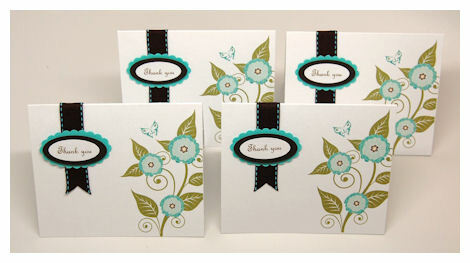 The first set of 4 were designed to coordinate with the design of the For Keeps template above. 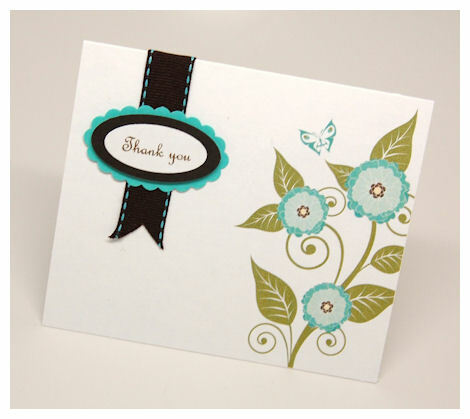 I used the Embellished Blossoms pattern from the Blooming with Elegance Pretty Printables Digital Paper, to serve as the focus of my card. Talk about EASY!!! Just print the size I wanted, cut and go! I saw a pillow in a magazine that totally inspired this set of card. It was just a few flowers, scattered/layered across part of the pillow. So I took the flowers from the Be Dazzled Stamp Set, digitally colored and layered them across my art board, then printed them out! It can’t get much easier than that! Note: You can save your creations so you can easily re-produce more in the future! Pull the design up and re-color them for a whole new look! 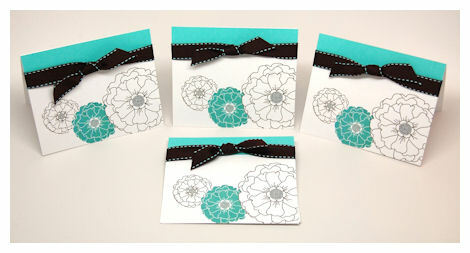 Here is another set that I created using images from the Be Dazzled Stamp Set. I just placed images where I wanted them, and then colored them digitally, for a quick set of 4 cards. I chose to layer on a sentiment from the Sensational Digital Package © . I love how it turned out. As stated above I was able to save this for future use, to allow me to quickly print n’ go! 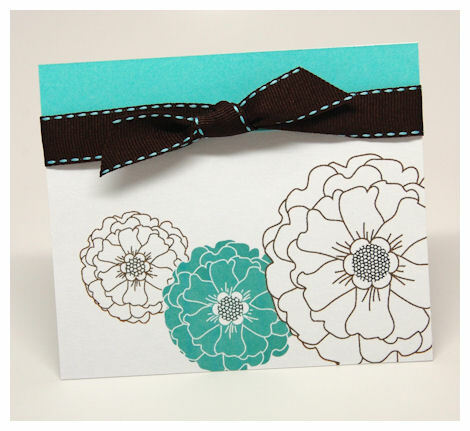 Having created these cards digitally was so quick, fun and easy! Now I don’t have to constantly re-create my designs! If I need/want other colors I just click my paint bucket and change the colors. We often feel that we don’t have the time to make a card, if you digitally create a few cards, you can always find the time to print, cut and go as I did with my cards here today. It quicker and cheaper than running out quick to BUY a card in a pinch. 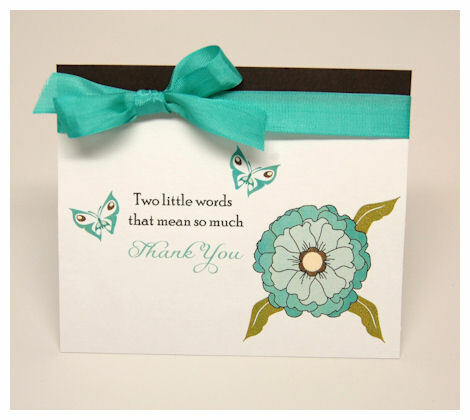 You can never have too many thank you notes. Upon creating this set, I made it because I am going to actually need to send Thank You cards, hopefully on a regular basis! Our daughter Amber recently received a 3 year modeling contract, in which she hopes to persue modeling/acting. She is learning so much in the classes they are having her take right now, and is LOVING it. Her latest modeling shoot went amazing, and the photographer and several staff members complimented her on several areas! I was very proud of her!! Most were surprised she was only 6 😀 They said she was very photogenic, professional, patient, and did excellent in taking directions, and was very easy to work with. WOW! Anyway, her classes are teaching her a so much, and she informed me (rightly so) that after she goes for an audition, it is important for her to send out a Thank You note, immediately following her audition for a shoot/role. 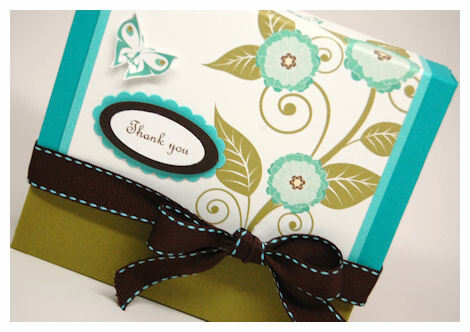 So I got to work on mass producing several Thank You notes, for me to keep on hand so I can send them out immediately. As you see, I made 12 right now, for times when I get really busy, and need to get them out! In the future I can just print and go, as I saved my designs for easy duplication in the future. She will soon be in a play: Snow White, with the Hampstead Stage Company, in late July. Not sure what role she will play yet, but I needed to send a thank you note out to the company ASAP! I think each collection is clean, and simple, yet professional. Well, thanks again for letting me share. Tomorrow I’ll return with more projects and ideas!